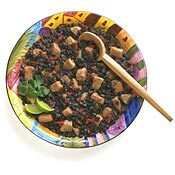 RECIPE TITLE "White Rice with Lime & Cuban Black Beans"
Two island favorites, black beans and rice, pair perfectly together, and are essential to any Caribbean-style cookout. The white rice is steamy hot, with distinct flavors of lime and garlic that shine through. The black beans are a hearty meal in and of themselves. Cooked slowly with pork, red onion, peppers and dried chiles, the beans have a stew-like consistency. Spoon over the rice and let the rice soak in the juices. Turn this hearty bean stew into a vegetarian dish by omitting the pork and sauteing the vegetables in the oil. Serve the stew with a green salad with red (Spanish) onion and orange slices for a colourful Latin-flavoured meal.